Tumbledown is our enormous gym and is brings the beauty of Maine’s summer inside. 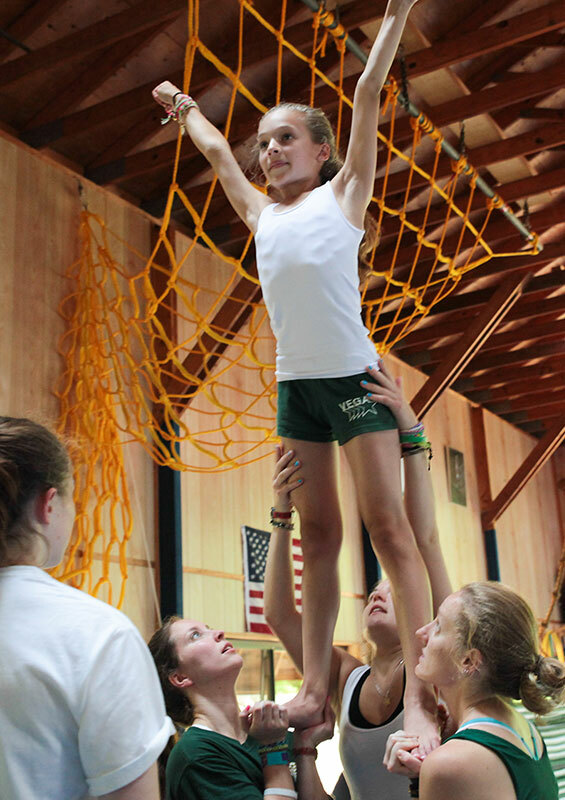 In Tumbledown, girls can participate in floor exercises, balance beams, uneven bars, single bar, vaulting, trampolines (with safety encasings) make up some of the activities girls can participate in at our gym. All four sides are glass, and you will be right beside Echo Lake as you practice tumbling runs on our bright blue spring floor. All our equipment and apparatus meets the highest current standards. Our very large staff has been helping Vega girls just like you develop new gymnastics skills, hone your current skills and help you all get ready for our huge gymnastics show. For those of you who love gymnastics, maybe even focus year-round on developing skills and routines, you will be able to join our Team program. Many girls choose to compete in the tournaments both at Vega and at other New England camps.